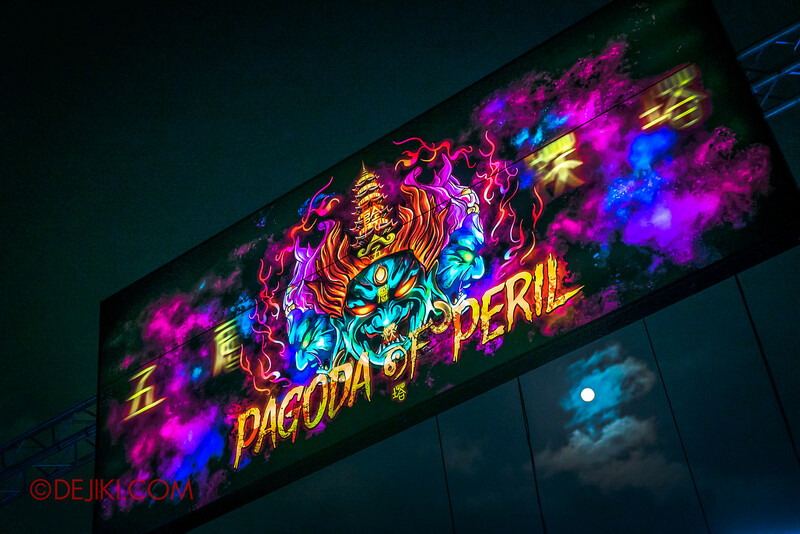 Journey into the supernatural realms at the Pagoda of Peril, where the Yin Demon awaits. 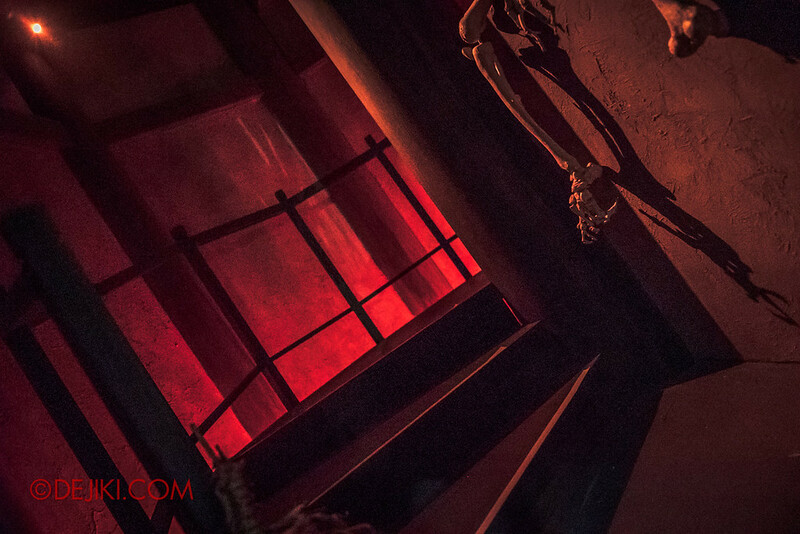 Photos of Pagoda of Peril, a haunted house attraction at USS Halloween Horror Nights 8, are featured here to showcase its design and atmosphere. 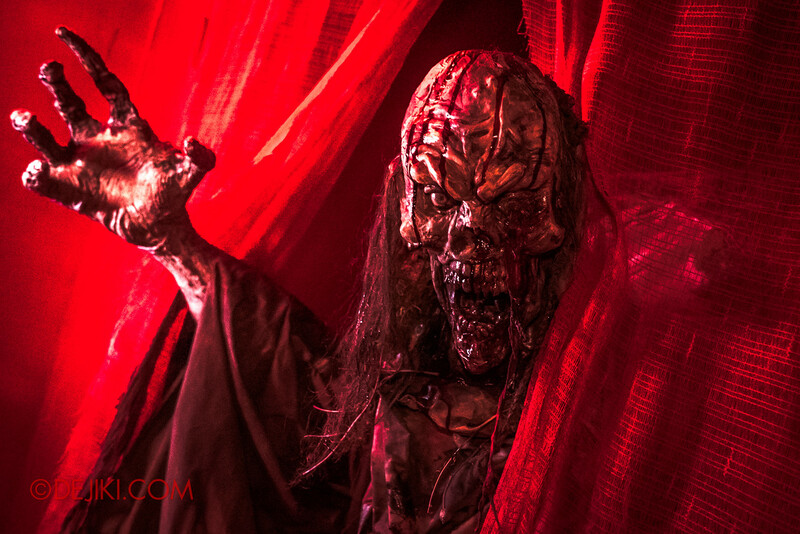 This is also a page for haunt fans to share their thoughts. The house at Waterworld is often the ‘confusing’ one. Pagoda of Peril is said to be a prison for spirits and ghouls. At every scene (or realm), I felt like I had disturbed the demons’ final resting place and was being chased away. The element of losing my way and getting trapped in the Pagoda is also missing – with minimal (or no) physical tricks done here to simulate any of those feelings. So I felt a bit let down, especially after watching the amazing animated short film by AMIEN that teased a certain supernatural-fantasy experience. I had hoped to learn more about the story of the Pagoda of Peril and malevolent Yin Demon, but apart from two scenes where he demonstrated his power, there wasn’t much to add on. It is also unavoidable to feel that elements from last year’s TERROR-Cotta Empress were repeated, with some scenes looking quite familiar. 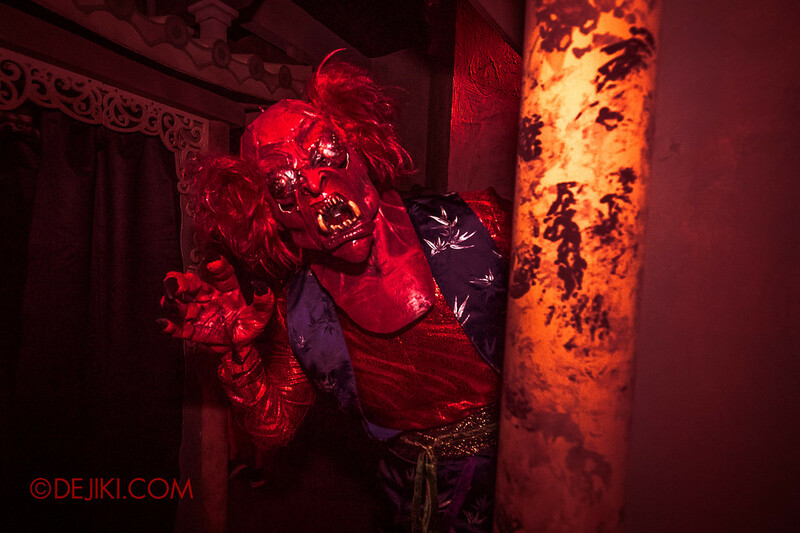 There are however, some pretty good scenes – the first one being the expansive “prayer hall” with its disorientating strobe lighting (and Hell House throwbacks); climbing “up” the Pagoda with a neat trick; and the second Yin Demon encounter which was a colourful spectacle. Then there were some rooms that didn’t make much sense (the altars and “jade” maze), especially the last scene that left a lot to be desired. 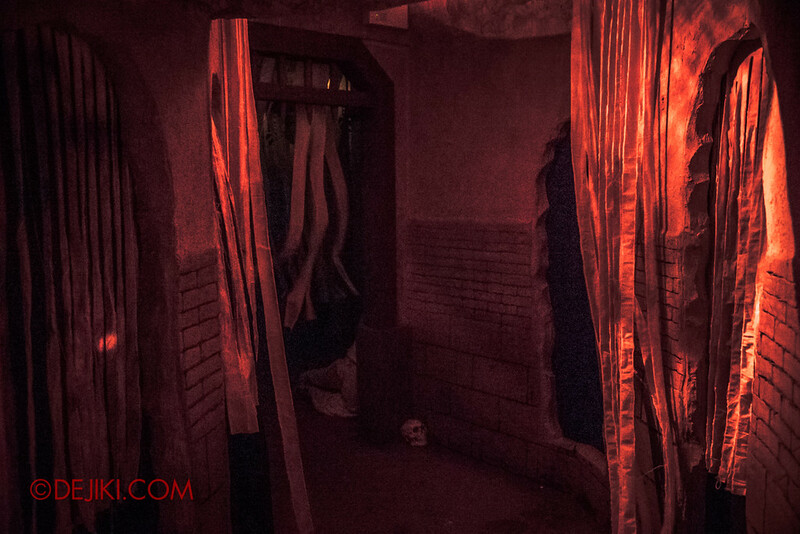 What did you think about this haunted house? 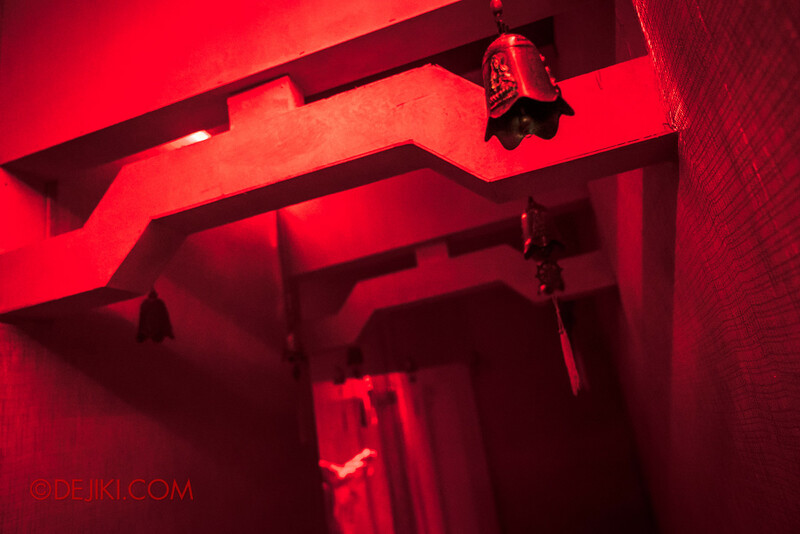 Step inside the derelict Tianlong Temple (or 天龙寺, Temple of Sky Dragon) as you find your way to the Pagoda. An old attendant rings a bell constantly in the prayer hall. As the lights flicker, spirits start to emerge. 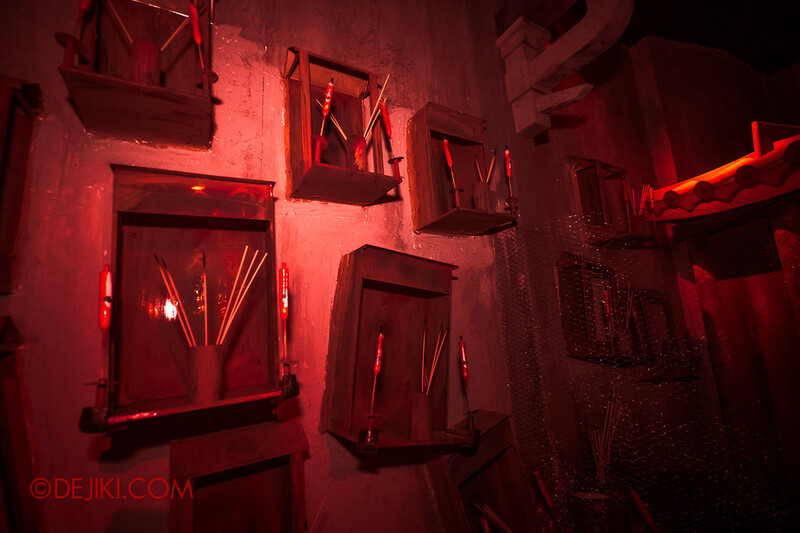 A lady in red floats around the overflowing boxes of incense and offerings. 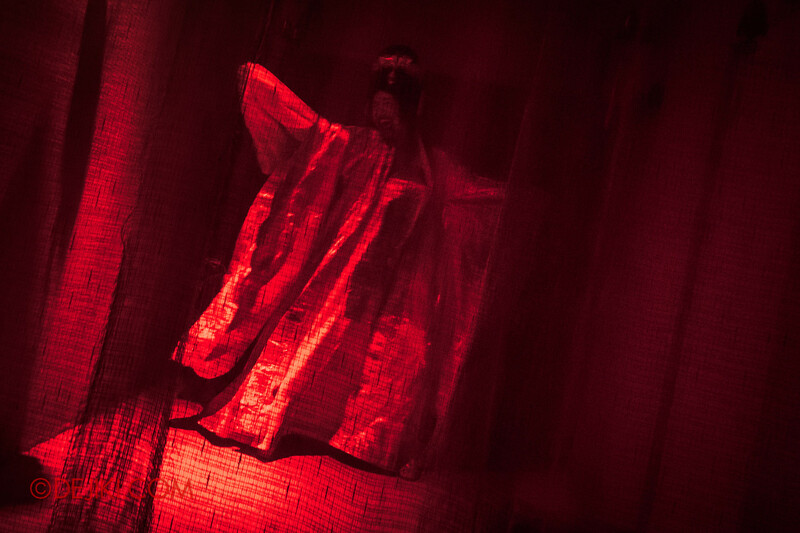 Dancing below coils of incense, she tempts you to enter the Pagoda. After a brief detour onto the Pagoda’s balcony area, you find yourself in a messy chamber crammed with altars and offerings. And demons. Your path takes a turn into a Jade maze, with lingering spirits in the shadows. Yin makes another apperance again in a torture chamber, making sure that you witness his supreme powers. It’s a surreal sight of colourful, dazzling violence. He commands you to step through another demonic gate. The drifting sound of wind chimes gradually drown into deep echoes. 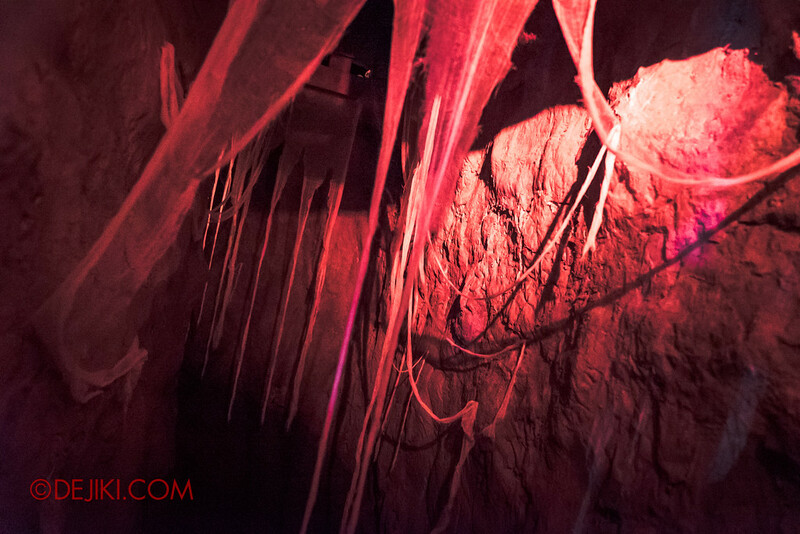 In this final realm, lights, smoke and sound disorientate you, while spirits make their final attempts to ensnare you. 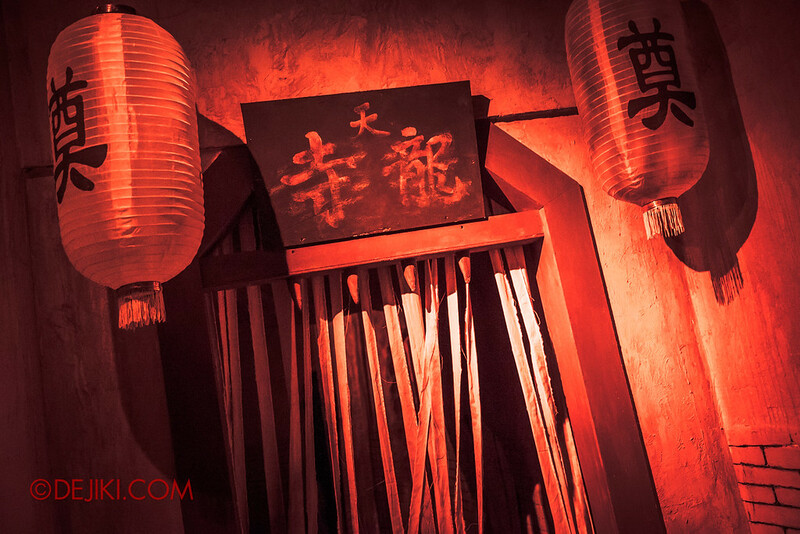 Dashing past a deranged Lady in Red, you can finally find a way out of the Pagoda prison. 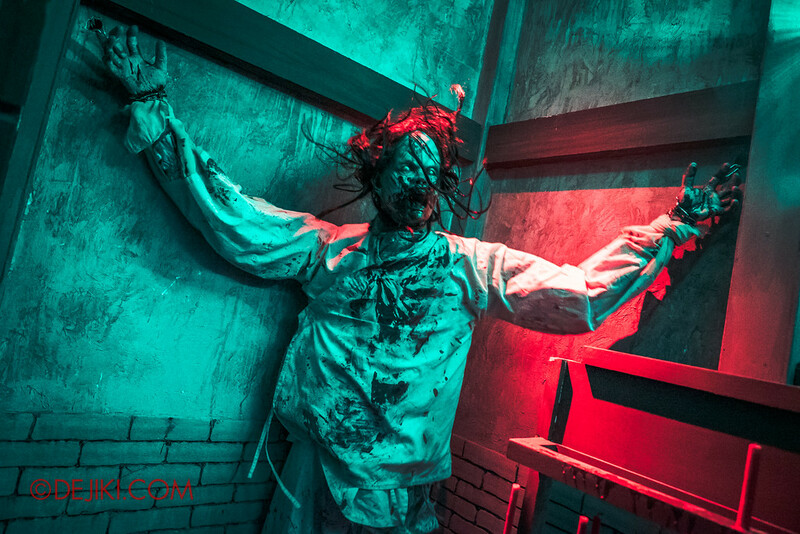 personally felt this was the scariest house because of the lighting and the loud sounds (majority of the scares are loud) indeed it felt very similar to terror-cotta empress. people who are superstitious or fear chinese ghosts would be terrified of this maze, otherwise it would just be confusing to most. I went on Thursday. 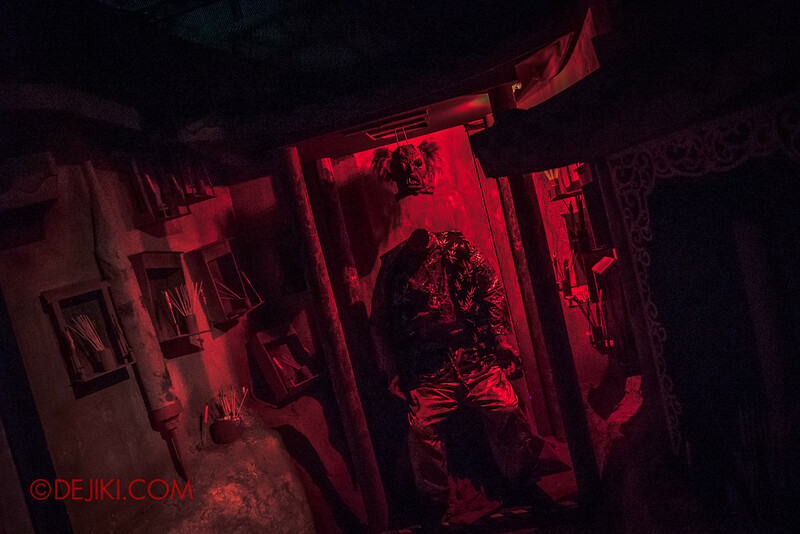 Personally, this was my 6th HHN. Flew in from Malaysia every year. Have always went on A Thursday. But there was no Thursday option last year which I went on a Sunday. Never have I seen this big of a crowd in the 6 years I’ve been. Would normally be able to clear at least 3 houses in the 1st hour or so then sneak into the rest during shows and do multiple repeats and then go in alone into some during near closing times. This year, I cleared one in the first 2 hours or so(Oiwa) and snucked into Killuminati when it was drizzling so there was a 20 minute or so wait but the walk in was snaking so it wasn’t fun at all. I was thinking of giving up. Longest wait time i saw was for pagoda at 240 minutes and Stranger Things and Pontianak was ranging 120-180 minutes. Crazy. 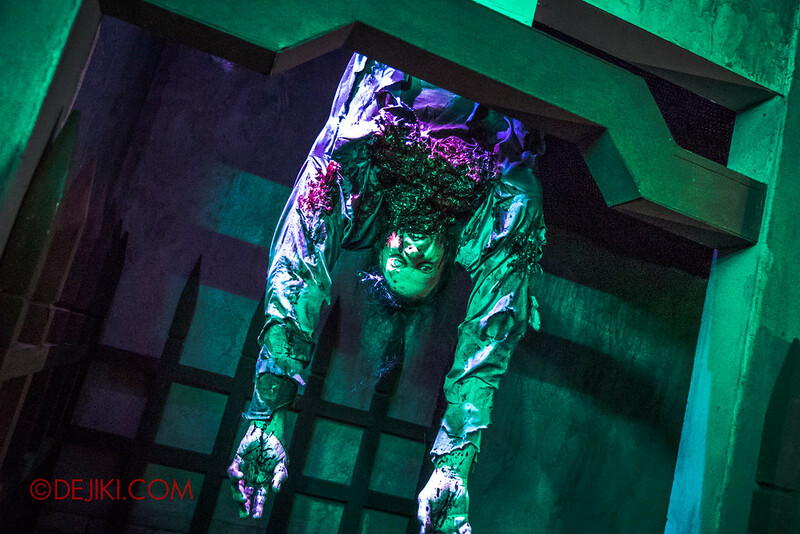 The wait times were the scarier part of HHN. Was banking on people leaving around 11pm or so which still did not happen. Went to 11pm Dead Talks and people were slowly leaving after that. Found out from park staff that they extended the hours to 130am due to the crowd. So gambled and got into Pontianak in about 20-25 minutes or so, moved to Pagoda and got in around 10 minutes. Walking back towards Stranger Things and so Pontianak had a 5 minute wait so went in again free of snaking crowds and just got into Stranger Things before it closed. The crowds were crazy this year. Yes, I was there that night and it was crazy due to the student crowds. Even getting into the park had long lines. Was it a student day or something? The crowds were absolutely crazy. Even hoping that people would start leaving after 11pm or so didnt work. Also, they extended to 130am initially, then reverted back to 1am closing time without informing anyone. Just managed to squeeze in into Stranger Things before it closed thinking I still had plenty time as I thought it was closing 130am. I was the last one in queue. Would have been pissed had I not been able to go to that as I went to all houses the previous 5 years since HHN3, repeatedly I might add. This year, only managed to repeat Pontianak once. Was a bit disappointed not being able to repeat Killuminati, Pagoda and Stranger Things. Oiwa was a bit mehh to me. May comsider going on a Sunday next year if Thursday crowds continue to be like this. No chance of flying down to USS this year as I’m heading to USJ in end October and planning to go to USJ on Nov 1. Here’s hoping I have better luck there.